Believe it or not, I had never read this before. I tried to read it one time and couldn't get into it. Someone told me to try again...so I did. While it's not the greatest comic I've ever read, it is pretty interesting and different. I think one of the reasons it was hard for me to get into it was the art. While Dave Gibbons is a very talented artist, his style is not one that rings my chimes when it comes to comic art. Part of the reason I read it was so I could be ready for the movie version that's coming out next year. A one-shot comic featuring an alternate origin story for the Joker. Here's another one I've never read but knew about it. This is the first time I've been able to track down a copy without having to buy it. This book is pretty amazing. 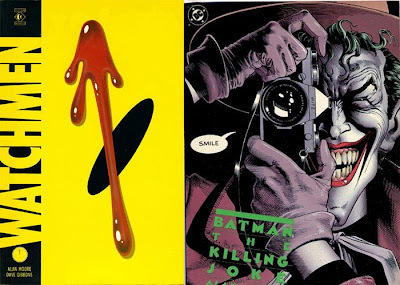 Brian Bolland is an incredible artist. I've been a fan of his since his Judge Dredd and Camelot 3000 days. The story is pretty grim but creates a sympathy for the Joker that hadn't really existed before. The comic is legendary and is regarded as perhaps the best Joker story ever told. I would have to agree but I would rank The Laughing Fish by Steve Englehart and Marshall Rogers up there too. I understand that Christopher Nolan provided Heath Ledger with a copy of this comic to consider for his interpretation of the Joker. Too bad they didn't go with the look as well. This comic clearly illustrates what the Joker should look like. I'm right there with you on Watchmen. It was an enjoyable series, but I never really understood how that series was all that and a bag of chips to comics. I am looking forward to the movie. Haven't read The Killing Joke, I'll see if I can find a copy. The Dark Knight starts Friday. I plan on seeing it hopefully prior to coming out on DVD.